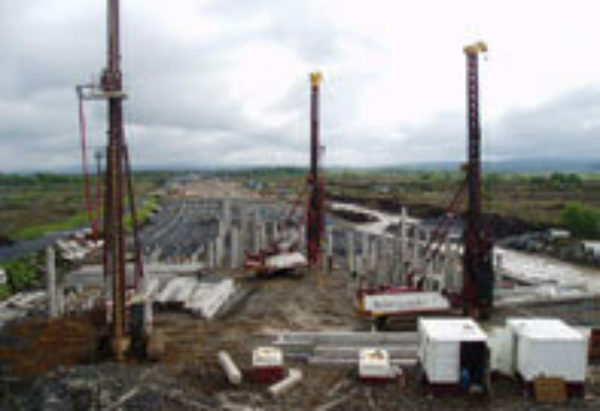 FK Lowry Piling carried out this contract in support of 35km of high quality dual carriageway running from Nenagh in Co. Tipperary to Limerick in Co. Limerick (the existing N7). With a view to project efficiency we cast 80 piles a day (between 4000-4800 metres per week – 120,000 metres in total) at a dedicated casting yard which we set up on site. Junttan rigs were deployed to each install up to 600metres of piling per day, with pile depths of up to 32 metres. Piles are supporting an earth embankment through a peat bog, with piles loads ranging from 49 to 80 tonnes. The “load transfer platform” (LTP) is a geotextile layer spanning between the pile caps supporting the embankment which varies from 3m to 8m high.